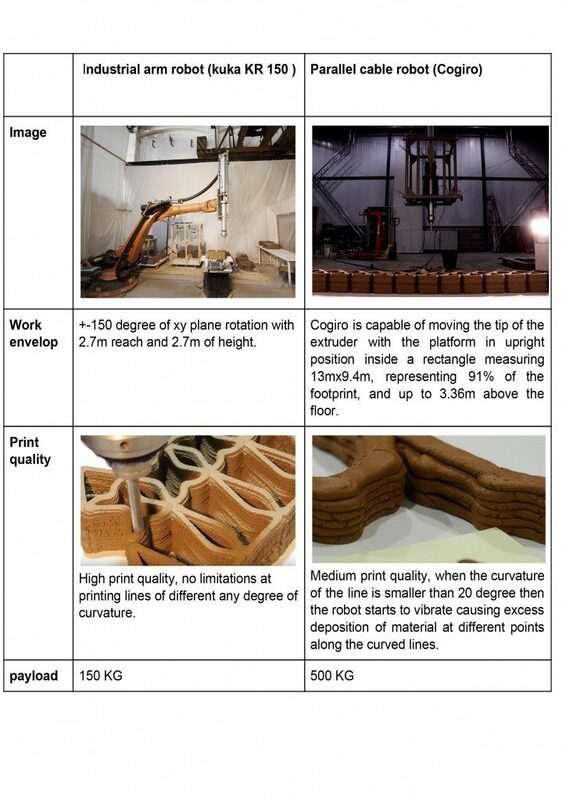 Comparison of design capabilities of the parallel cable robots (COGIRO) with KUKA industrial arm robots in the field of architectural scale AM with clay, having the same payload. Additive manufacturing (AM) has evolved from being a niche industry into a mainstream technology in the past decade. However, there has been a minimal investigation done on large scale AM. 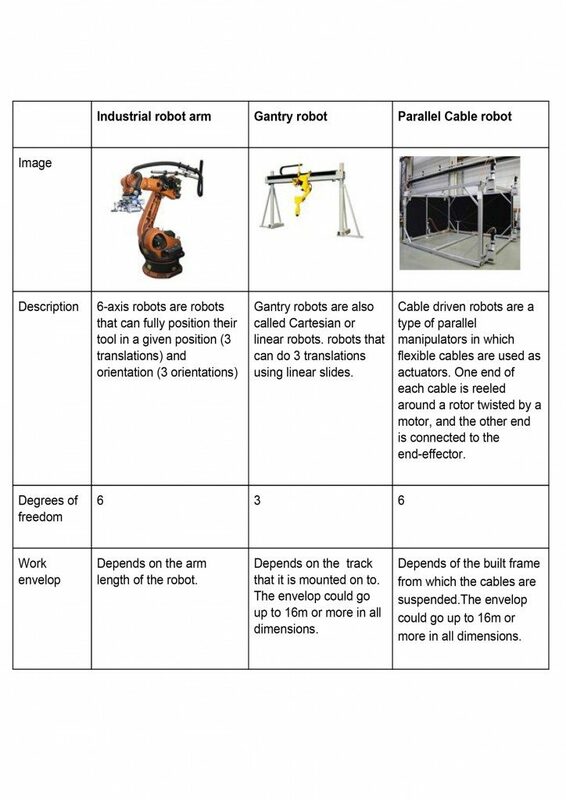 This study compares existing large-scale robots, such as the industrial robot arm mounted on a mobile base, the gantry robot, the parallel cable robot, based on their range of printability, transportability, cost, configuration/ positioning difficulties. The article then focuses in detail on a comparative study between a parallel cable robot and an industrial robot arm in AM based on, installation cost and time, energy consumption, possible support attachment, the versatility of uses, the degree of freedom available and design possibilities. The research consequently defines a design alphabet for each robot which incorporates the design possibilities and limitations previously studied. Factors affecting the design alphabet are vibrations around the trajectory in the x and y directions based on the radius of curvature of the print line, the deflection control of the robot under the varying material weight in the cartridge, and the range of printable space. Finally, a printed example is shown proving the possibilities and limitations. Keywords: Additive Manufacturing, large scale 3D printing, parallel cable robot, an industrial robot arm. From the above comparison, the industrial arm robot and the parallel cable robot are considered to enhance design possibilities in AM because of their potential with respect to degrees of freedom in movement. Both of these could be upgraded to have 7 axis simply by installing a rotating table base. Further comparison between the industrial arm robot and the parallel cable robot based on the print quality and size. From the above table, kuka KR 150 has a high level of print quality in AM but has a lower work envelop when compared to cogiro which on the other hand has low print quality but has a higher work envelop. For AM in large scale, high precision in detail printing is not required the main requirement is the work envelop which gives the range to print large habitable spaces. Barnett, Eric and Clément Gosselin. “Large-Scale 3D Printing With A Cable-Suspended Robot”. Additive Manufacturing 7 (2015): 27-44. Bosscher, Paul et al. “Cable-Suspended Robotic Contour Crafting System”. Automation in Construction 17.1 (2007): 45-55. “KUKA Robotics | KUKA AG”. Kuka.com. N.p., 2016. Web. 8 Dec. 2016. “ROBOTICS In TECNALIAROBOTICS In TECNALIA”. Tecnalia.com. N.p., 2016. Web. 8 Dec. 2016.